Both writers believed that artists should "imitate nature', but they differed in their interpretations of "nature'. 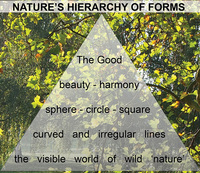 For Reynolds, nature meant the ideal world of the Platonic forms. For Hazlitt, nature was far closer to the world of empirical reality, which included "both masses and details'. Their interpretations are the consequence of an epochal swing, from classicism to romanticism, from rationalism to empiricism, from universalism to individualism. The change caused a profound crisis for landscape theory. Fig 13.1 (above)1800 saw a Great Turning Point in the history of garden design - when the ancient theory that 'art should imitate nature' almost from the impact of Three Stakes (Fig 13.2, below) driven into its heart: Empiricism, Geography and Functionalism. Its heart of landscape theory is represented by Repton’s trade card.